Restaurateurs and shop owners are discovering what we've known since 1998: the Seaport is the place to be! We've watched the neighborhood around us grow up and boom into being Boston's go-to spot for living, working, and - most of all - playing! We love the array of nightclubs, eateries, and luxury stores opening, but there's still something ideal about grabbing a coffee and just strolling along our picturesque Harborwalk. 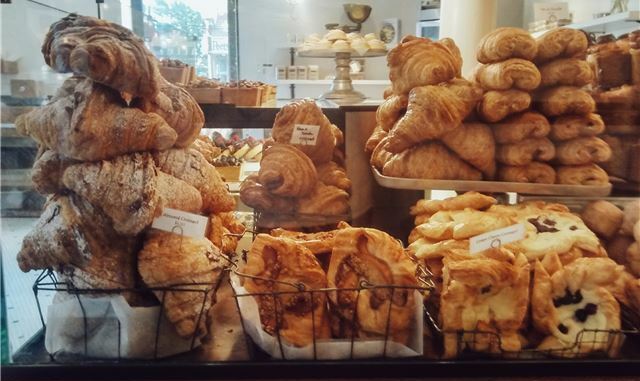 Tatte Bakery has had us flocking to Brookline since it first opened in 2008. Founder and chef Tzurit Or is known for her beautiful pastries and equally gorgeous cafes. The company has grown from the original Brookline branch to 11 locations across Boston and Cambridge. Those of us in the Seaport were elated to get our own Tatte earlier this month when Tatte Bakery opened at 200 Pier 4 Boulevard. From gluten-free sandwiches and morning treats to Mediterranean meals and scrumptious deserts, Tatte keeps us coming back for more (and glad we have at least a few blocks between there and the hotel to walk off the calories). If you're in a rush but still in need of java, don't forget about our very own Seaport Café, located at the lobby level of the hotel. From to-go coffee to personalized breakfast sandwiches, we'll fuel you up to seize the day!